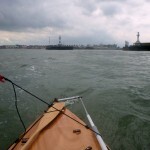 I’d arrived in Lowestoft late into Saturday evening feeling very tired after the toughest passage yet, from Shotley. 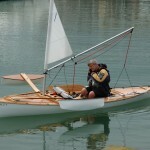 It hadn’t been so much the duration of the sail, less than eight hours, but more the physical and mental demands of steering and balancing the boat in the midst of large following waves and a fresh (force 4 to 5) breeze. So I was glad to be able to rest up for a day and recover. 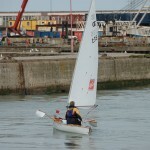 Any thoughts of setting off again on Sunday had evaporated after hearing a wind forecast of force 4 to 5 gusting 6. I spent a very pleasant day in Arthur and Jenny’s company with Arthur kindly running me to a yacht chandler’s for another dry bag and to replace my hat (which had been swept overboard during a particularly strong squall the day before) and then to the beach at Winterton to look at the size of the breakers coming ashore. After Yarmouth, around 10 nautical miles North of Lowestoft, there would be 40 miles of coast without any harbour before Blakeney on the North Norfolk coast. 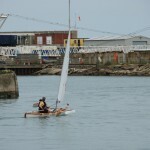 So my main options would be to sail 50 miles in one go or to get ashore somewhere for an overnight stop. Anchoring and sleeping in the boat was another possibility, but this would be likely to be very uncomfortable along this exposed coast. As my experiences at Hastings had shown, landing a small boat on a beach amidst breakers can be fraught at the best of times and attempting it alone more than doubly so. However, the breakers on the wide beach at Winterton were only a foot high and I concluded a solo beach landing the next day would be doable. Later we visited Arthur and Jenny’s very productive allotment where they grow most of their fruit and vegetables. Jenny had picked huge quantities of strawberries, broad beans and also some artichokes for an evening meal. 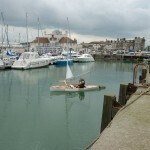 Arthur and Jenny have sea kayaked in diverse parts of the world including Alaska, Belize and Mexico. 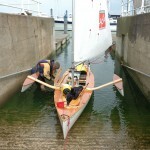 They also own a Drascombe Coaster which they sail on the Broads. 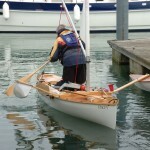 We talked of sailing and kayaking, and Arthur told me a bit about his second career in boat building. I was sorry to have to leave the next day. 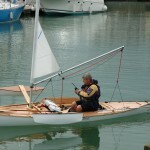 The following morning, Arthur added a backup linkage to the flexible rubber joint steering connection between my tiller and tiller extension. I’ve never heard of one of these joints failing but I’d been concerned about how I’d cope if the joint did fail at sea in rough weather. 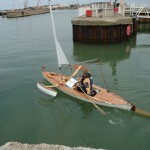 Arthur later ran me and my kit back to the Royal Norfolk and Suffolk Yacht Club, which had kindly found a space to store Stacey free of charge, and I launched at around just before 3 as tide started to run northward. 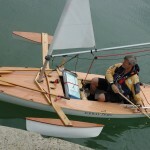 For a change winds were light and I mostly paddle sailed, tacking against the northerly wind. A strong swell from the northeast worried me and I could see lines of breakers to my left. Presumably, a storm far out to sea, off Scandinavia maybe, had caused the swell which was running in a different direction to the wind. 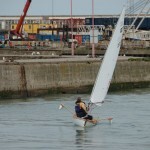 I found a corner on the beach at Yarmouth behind the harbour to land clear of waves and change into my drysuit. A lifeguard helped me drag Stacey back into the water. 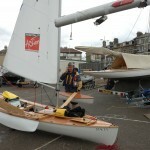 As the grey day wore on, the wind and tide died and progress slowed. I ‘d hoped to make the village of Sea Palling where artificial reefs running parallel to the shore would make a landing sheltered from breakers possible but the light was beginning to die so I prepared to put ashore at the slight headland of Winterton Ness. As a precaution I removed the rudder, which can be vulnerable to damage during rough beach landings. A seal kept popping its head out of the water and watched me curiously with large brown eyes as I paddled against the slight breeze and toward the steeply sloping shoreline. I hoped this was a good omen. Waves began to tip the boat forward as they passed and then just before I was about to land a large breaking wave roared up behind me, slewed Stacey across the face of the wave and tipped me headlong out the boat and into the surf. However, I managed to get onto my feet, right the boat and drag her ashore before further breakers caused any damage or swamped the boat. The seal emerged from a wave for a last look before going off to tell his mates about the spectacle. Getting Stacey above the high tide mark was challenging but unloading most of the sailing / camping kit and a 2 to 1 pulley system helped and then a passing bird watcher gave me a hand, in the half-light, with the last 20 yards. Unfortunately, my mobile phone on a lanyard round my neck had disappeared without trace as I dived into the sea. I climbed to the top of the sand dunes to get a signal and made a few phone calls on a backup mobile to ensure others knew I was OK and that Arthur and Jenny, who’d been waiting for me at Sea Palling, were not worried by my non arrival. I’d been shaken by the rough landing but set about preparing for the night before the last of the light completely faded. Although cold and moonless the night was cloudless and no rain was forecast. So, after a miniature bottle of red wine, reserved for such an occasion, and a brief meal of bread and soup, I put on extra layers of clothing and climbed into a bivvi bag on the sand. I looked at the stars and the inky black sky overhead before falling asleep. I awoke about four hours later feeling bone achingly cold. Walking up and down the beach for twenty minutes helped to restore my body temperature. A seal like shape loomed out of the darkness and gave me a fright. Momentarily it had seemed the seal had returned to haunt me, but it then morphed back into a small tree trunk. After getting out of my drysuit and into a sleeping bag I fell asleep again just as the sky was starting to lighten before dawn.